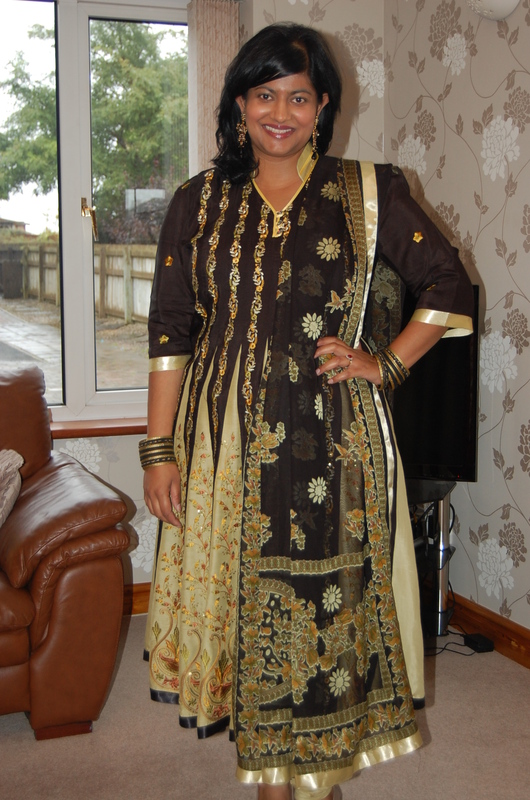 This is my first attempt at sewing an Indian outfit. I bought the material months and months ago and it was sitting in my closet waiting to be either taken to India to be sewn by a tailor, or for me to be brave enough to sew it without a commercial pattern. Guess I got brave enough! For those who don’t know, churidar refers to the lower part of the outfit (the “bottoms”) and kameez is the name given to the top part. I think this particular style is anarkali kameez, named, I imagine, for the slave girl Anarkali who, during the Mughal period, was supposed to have had an affair with Crown Prince Salim. Prince Salim’s father, Mughal-e-Azam, did not like the fact that his son wanted to marry a lowly slave girl, and so the story goes that in exchange for keeping her lover alive, Anarkali agreed to give up her life, and was supposedly buried alive between two walls by Mughal-e-Azam. Romantic or stupid? You decide. Anyway, Anarkali was a dancer I think. And so the Anarkali kameez would have given her freedom to shake her booty to her hearts content. Churidar are like long leggings and are supposed to be tight fitting around the ankles/ calves, with the excess material falling in to gathers around the ankles/ calves (like bangles around the leg: “churi”; bangle, “dar”; like). This is supposed to give a graceful and lengthening appearance to the leg. True churidar should be cut on the bias, as this gives the material more stretch and allows it to fit more easily to the contours of the leg. 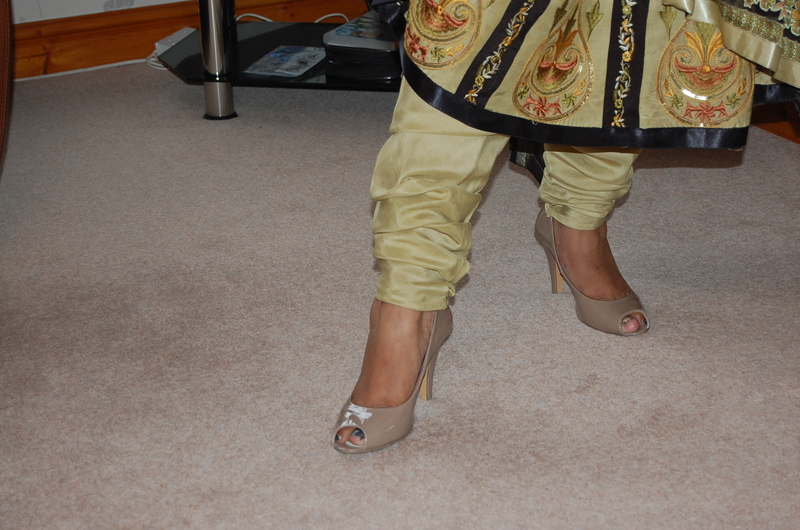 So I did cut my churidar on the bias. First lesson learned: to make bias cut churidar you need A LOT of material. Like maybe double the quantity of material you would normally use. I did not have this much material and had to use a different material to sew the top part of my churidar, but hey, no one will ever know! I will probably put up a tutorial on cutting and sewing bias cut churidar when I get the chance, but I basically used an existing churidar as the pattern. Overall I am quite pleased with the finished outfit. The churidar could perhaps have been a bit tighter all over, and also I don’t like all the excess material that appeared in the top part of the churidar (will post pictures of that in the tutorial). The kameez was not very difficult to make. I just had to sew up the sides and attach some sleeves. 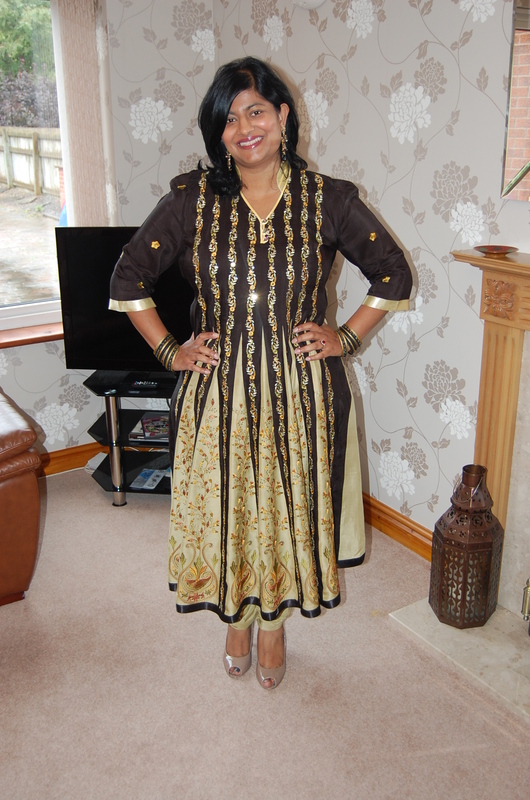 As you will see from the pictures, this kameez came with the neckline already completed. I wish it was lined but, frankly, I could not be bothered to cut a huge amount of fabric to line it. I am considering making a separate slip instead. 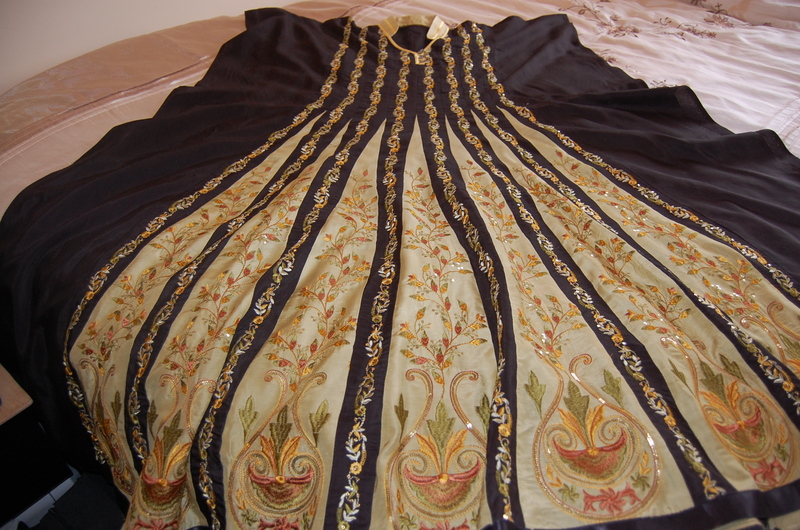 View of unstitched kameez fabric. I had to sew the sides and cut armholes, and cut and sew the sleeve pieces. We are off to India in about 10 days time, so maybe I will have an excuse to wear it then, if I don’t buy a zillion other new outfits when I am over there! Fantastic sewing! and gorgeous fabric. Admiring your work from Georgia, US. Looking forward to the tutorial. Hi Jemimah, thanks so much for your comment. The internet makes the world a much smaller place doesn’t it? 🙂 I will put the tutorial up, but it will probably have to be after I get back from India now. Keep watching! Thanks Eileen. Thanks so much for visiting…come again! Oh my!!! you made that? :O (Picking my jaw off the floor)..That’s amazing, eh! Hi Uma, thanks so much. I really hope I can sew some more Indian clothes soon. Amazing! You are gorgeous… and so is your dress! Aww thanks so much Beth! Like wise I am following your blog in bloglovin. Great to be in touch. I am late, late to this but your outfitis breathtaking! I love it! Lovely!! Thought you may be interested in a website I know/love for Indian/Pakastani clothing making. Her Churidar method is brilliant! Jansewingsolutions.com or also she has a YouTube Chanel dilpasand2000. Oh thanks cherita. I will check it out. really beautiful anarkali kameez ! Could you show pictures of that please ? Bc I’m wanting to buy a suit like that but I’m tall (5″8 or 9) if I’m not wearing heels so most readymade salwars are really short….. So I need an idea …. Btw how tall are you ? Hi I am 5 foot 3. Sorry but I cannot upload any pics until I am back from my holiday in a week or so. This is gorgeous! And to think that you could purchase the fabric “ready to tailor” as it were. I guess you’ll be making more of these! What fantastic fabric.. I just clicked on this to have a better idea of the fabric you had used…. What a fantastic outfit.Did you get some wear out of it on your trip? Did you but this fabric on line as well? Thanks jan. yes I bought this fabric online and I think I wore it once whilst away! Wow wow. How did I miss this post? This is absolutely beautiful. Absolutely beautiful. Great construction and details. Looking forward to your tutorial. Just seen this and had to comment. It’s beautiful and so interesting too! 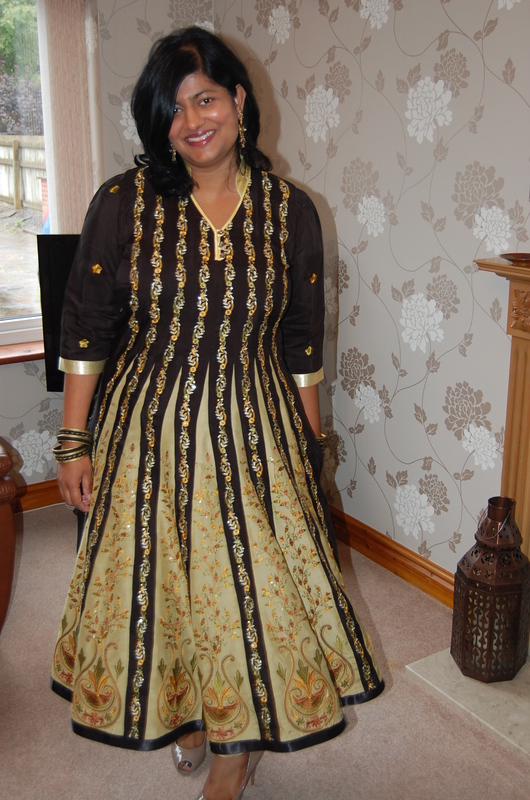 Hi Manju, gorgeous dress. Perfectly stitched. Couldn’t find link to the tutorial. Pls can you share. Would love to make one. You’re such a natural at sewing. I also notice you’re not afraid to make changes when necessary – you don’t just give up. And you try new things! This has to be one of the most beautiful dresses I’ve seen… and it fits you perfectly. Wow. This is quite stunning. I’m a bit confused though- you say the kameez came with the neckline already completed. Where does one purchase something like this? The style is very flattering and having that much of the work completed would certainly be a time saver. If you search for unstitched or semi stitched shalwar you should find lots online.